We are a Surat-based web and mobile development company and spreading our branches across the globe. We have always welcomed innovations and have delivered success for all our clients. Our team with diverse background shared a common goal to achieve perfection in all our endeavours. Our seasoned team of developers has developed more than 1000+ apps and is always striving hard and walking that extra mile to deliver excellent apps for all our esteemed clients. Through Surat JS meetup, we wish to share the updates and scopes of technology with all the newbies and experienced tech-innovators. Technological events are always a great chance for the tech-savvy people to keep themselves updated and upgraded. 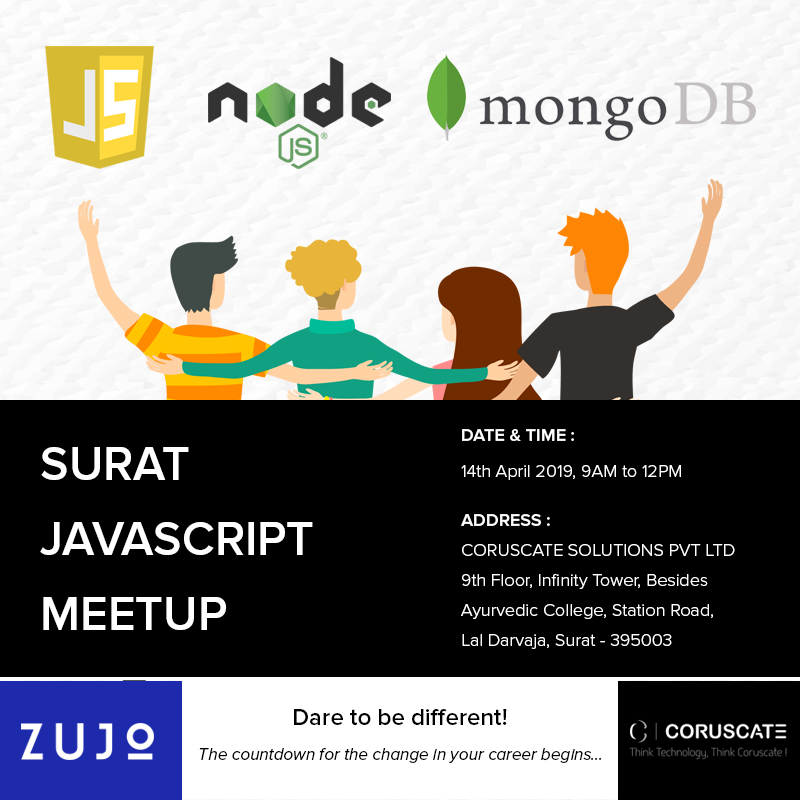 So, the Surat JS meetup event at Coruscate is an exciting opportunity for all the technology students, trainees, and interns in Surat IT companies, startups who want their developers to upgrade and the developers who are interested to brush up their skills and want to keep themselves one step ahead of the competition. Wondering what makes this event special than all the other events that you have attended in other Surat IT companies? Here are 3 thrilling reasons that will convince you to attend the event without thinking about any excuses. Are you a beginner for Node JS and Express JS? We are going to cover the fundamentals of both the technologies just for you. We have every little bit prepared to clear your doubts with examples. There are three assumptions that Relay JS makes about the GraphQL. At the meetup, there will be a discussion about when and why to use GraphQL while you are working on a project. The speakers will explain the usage of Relay JS with GraphQL and also throw light over the comparison of Relay and Redux and which one is more appropriate to use under certain scenarios. There are other interesting technologies that will be discussed in the meetup too. These are the highlights of the technical hits that you will find on your plate in the Surat JS meetup. and much more that will leave you wanting for more. You will find yourself motivated by some extraordinary speakers from the Surat IT companies at the JS meetup. He is an entrepreneur with a demonstrated history of working in the information technology and services industry. He is skilled in Machine Learning, Deep Learning, Leadership and Product Development. He started his own company straight out of college. He has great marketing skills and is a seasoned IT entrepreneur running two top MNC companies. He is passionate and motivated in working towards creating a huge Indian multinational. No meetup ends without Q&A sessions. But Surat JS meetup will be somewhat different as you will be able to clear each little doubt about the technologies comfortably. The energy and spark of the speakers will be contagious for you. So, if you have not yet registered yourself for the meetup, make haste. We have limited seats which are filling fast. As it is said, ‘it is only you who can make a difference.’ The Surat JS meetup will definitely be your first step towards success.